These tutorials are specific to Cobalt™, Xenon™ and Argon™, Ashlar-Vellum’s 3D solid and surface modeling programs, and are applicable on both Mac and Windows platforms. All video tutorials are available on our YouTube Channel. If you would like to submit a tutorial, or an idea for a tutorial, please email us at tutorials@ashlar.com. We welcome your comments or suggestions. 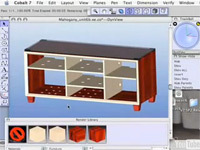 This movie demonstrates the Ashlar-Vellum CAD 3D Modeling Interface featuring the Drafting Assistant. Suitable for Argon, Xenon and Cobalt CAD and 3D modeling software. Click to play the tutorial. This movie shows how to use the Trackball in Argon, Xenon and Cobalt CAD. This movie discusses the Show/Hide window and the Design Explorer available in Argon, Xenon and Cobalt. Get an introduction to the Ashlar-Vellum interface and how it is used to create, edit and manage geometry. Suitable for Argon, Xenon and Cobalt solid, surface and wireframe 3D modeling software. Download the tutorial in PDF (1.2 MB). A general discussion on the general workflow, uses of surfaces and solids and understanding the problem solving process in modeling. Suitable for Argon, Xenon and Cobalt precision 3D solid and surface modeling software. Download the tutorial in PDF (.7 MB). This short movie demonstrates how to create 2D jigsaw puzzle pieces. Suitable for Argon, Xenon and Cobalt 3D solid and surface modeling software. 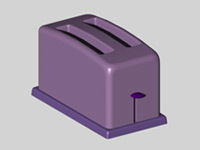 An introductory tutorial which explores the construction of a simple toaster with the Ashlar-Vellum 3D modeling products. 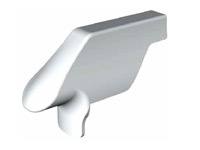 Suitable for Argon, Xenon and Cobalt 3D solid and surface modeling programs. Download the tutorial in PDF (1.4 MB). This tutorial demonstrates how to create a simple shape like this bowl. Suitable for Argon, Xenon and Cobalt 3D modeling software. Download the tutorial in PDF (.9 MB). This movie demonstrates how to solid model a lathed bowl. Suitable for Argon, Xenon and Cobalt precision solid and surface modeling software. This movie shows how to renders the lathed bowl. 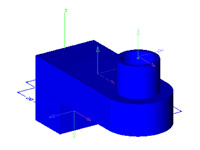 Suitable for Argon, Xenon and Cobalt precision solid and surface modeling software. This movie demonstrates how to solid model a hand dovetailed drawer. Suitable for Argon, Xenon and Cobalt precision 3D solid and surface modeling software. This step-by-step tutorial describes how to use Ashlar-Vellum’s 3D modeling software to create a curved plastic cap. Suitable for Argon, Xenon, or Cobalt CAD and 3D modeling software. This tutorial demonstrates how to create a tension spring. Suitable for Argon, Xenon and Cobalt 3D modeling software. Download the tutorial in PDF (.3 MB). An intermediate tutorial which constructs a sprocket wheel using a combination of wireframe, surfaces and solids. Suitable for Argon, Xenon and Cobalt precision 3D modeling software. Download the tutorial in PDF (.6 MB). This tutorial demonstrates how to set up geometric constraints and equations to drive geometry in Cobalt’s Digital Constraint Manager. 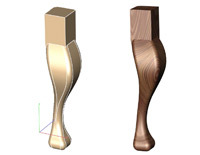 Suitable for Cobalt precision CAD and 3D modeling software. Download the tutorial in PDF (.5 MB). A quick way to create fan or turbine type shapes. Suitable for Argon, Xenon and Cobalt CAD and 3D modeling programs. Four simple methods for creating buttons or dome shapes. 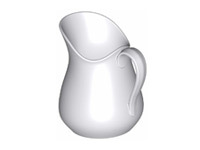 Suitable for Argon, Xenon and Cobalt solid and surface modeling software. Download the tutorial in PDF (1.0 MB). This tutorial demonstrates how to define an organic shape with wire frame geometry and create a single, smooth surface around that wireframe. Then it shows how to make that surface into a solid and add details. Suitable for Argon, Xenon and Cobalt precision 3D solid and surface modeling software. Download the tutorial in PDF (1.3 MB). Very often we come across shapes that look very simple at first glance, but turn out to have a subtle yet complex shape. Download a 3D model in Cobalt (.03 MB). A quick and easy way to make cabriole legs. Suitable for Argon, Xenon and Cobalt precision solid modeling software. How do you create objects like phone cords, DNA, elegant jewelry or vacuum hoses? Look at this tutorial to find out. Suitable for Argon, Xenon and Cobalt precision modeling software. Very often we come across shapes that look very simple at first glance, but turn out to have a subtle yet complex shape. Suitable for Argon, Xenon and Cobalt precision 3D solid and surface modeling software. 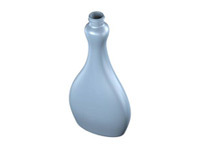 In this tutorial we model a spray bottle top. This is a deceptively simple looking shape, but can actually be a little difficult. Suitable for Argon, Xenon and Cobalt 3D modeling programs. A great quick start tip sheet created by Randy Primozic on how to place decals. Suitable for Argon, Xenon and Cobalt photo-realistic 3D modeling software. 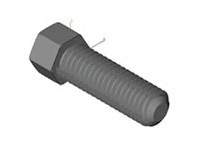 An intermediate tutorial which shows how to model a threaded hex bolt. Suitable for Argon, Xenon and Cobalt precision CAD and 3D modeling software. An introduction to creating walk-through and fly-by animations. Suitable for Argon, Xenon and Cobalt photo-realistic 3D modeling software. This short movie shows you how to easily create 2D engineering drawings from a 3D model. Suitable for Argon, Xenon and Cobalt CAD and 3D modeling software. This 26-minute movie shows basic part creation from start to finish. Suitable for Argon, Xenon and Cobalt 3D solid and surface modeling programs. 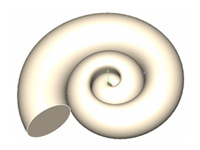 A quick way to make spiral shapes from sea shells to pump housings. Suitable for Argon, Xenon and Cobalt precision CAD and 3D modeling software. A look at how the different types of texture space shaders work in the Ashlar-Vellum rendering environment. 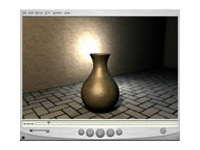 Suitable for Argon, Xenon and Cobalt photo-realistic 3D modeling software. Often there is a need to create smooth, domed shapes that are not just simple, round geometry. Suitable for Argon, Xenon and Cobalt precision CAD software. An introduction to simple organic modeling. Suitable for Argon, Xenon and Cobalt precision solid and surface modeling software. Use basic shape editing, shelling and blending to create a bottle with threads. Suitable for Xenon and Cobalt precision CAD and 3D modeling software. Download the tutorial in PDF (.8 MB). In this lesson are some general guidelines to help make your renderings look photo-realistic. Suitable for Argon, Xenon and Cobalt 3D modeling programs. Download the tutorial in PDF (6.6 MB). This 17-minute movie is a great tutorial on effective rendering techniques for glass and wood. Suitable for Argon, Xenon and Cobalt 3D solid and surface modeling programs. A more advanced tutorial which explores the construction and rendering of a headlight. Suitable for Argon, Xenon and Cobalt photo-realistic precision 3D modeling software. Download the tutorial in PDF (7.3 MB). An intermediate tutorial which shows the associative features of Xenon and Cobalt. It also covers basic rendering techniques to produce this image of a sink and faucet. Suitable for Xenon and Cobalt CAD and 3D modeling software. This tutorial demonstrates how to model a house. Suitable for Argon, Xenon and Cobalt precision CAD and 3D modeling software. Download the tutorial in PDF (1.5 MB). A thorough tutorial covering the modeling of the Cube computer. This tutorial begins with wireframe creation and goes all the way through lighting and rendering the image you see to the left. A full, comprehensive lesson of over 30 tools within the Ashlar-Vellum software. Suitable for Xenon and Cobalt precision 3D solid and surface modeling software.